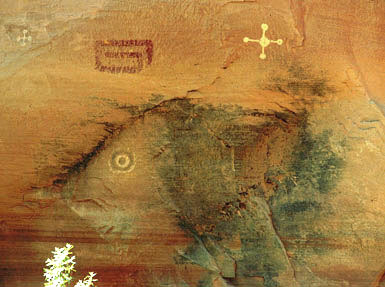 Campbell Grant's Canyon de Chelly, Its People and Rock Art lists more than 100 rock art locations which, he writes, "encompass the major locations" in the canyon. For those readers seeking more information I highly recommend Grant's book for its wealth of information and illustrations. 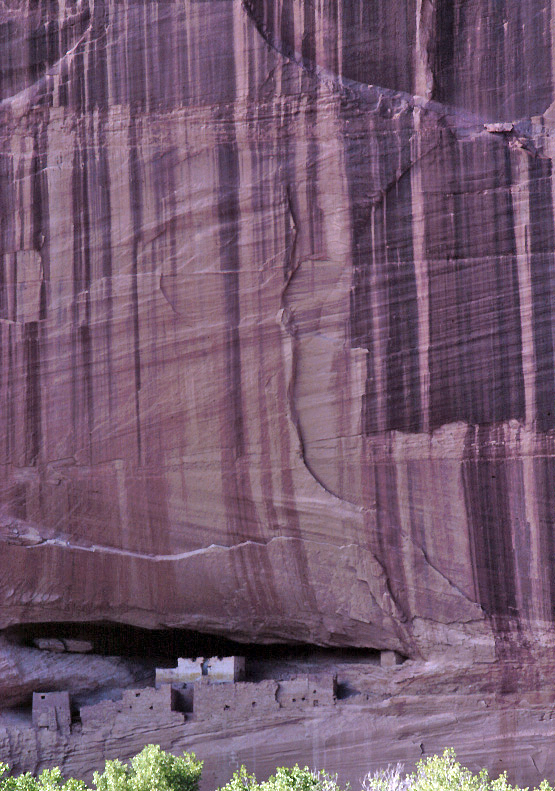 Canyon de Chelly is both a National Monument and a home to many Navajo people. Therefore the entire canyon is not open to the public. 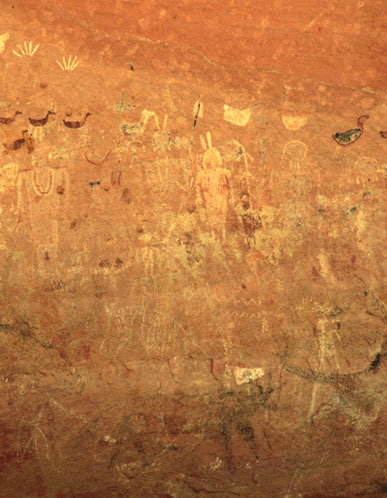 If you wish to explore the rock art of the canyon check with the Park Service office first to see where you are allowed to hike. To enter other areas you must hire a Navajo guide. 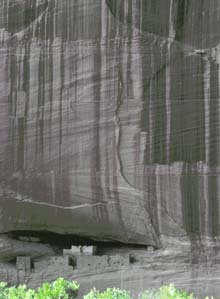 Their fees are very reasonable, and, I discovered, their company makes a journey in the canyon all the more rewarding. Our guide knew a set of Moqui steps, so we were able to take a shortcut out of the canyon and up the sheer cliffs. At the top of the 600-foot Moqui "ladder" we were exhausted and our guide was unfazed. There are also jeep tours of the canyon. These are focused on the major ruins. 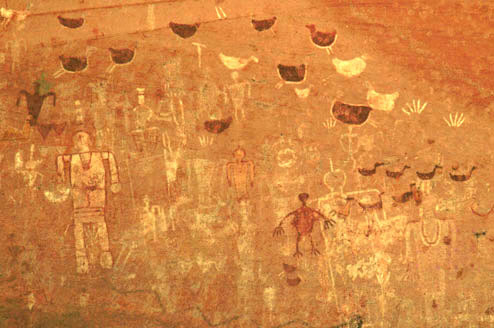 If you inform your driver that you are interested in rock art you may see more panels than the average tour. I recommend all the available hikes as a first phase of discovery, followed by the jeep tour. If your appetite is only wetted at this point, hire a guide and do one or several half-day hikes to other sections of the canyon. Below depicted are four photographs of the Blue Bull Panel. The views begin with the leftmost (facing the cliff) section of the panel. Note the anthropomorphs with necklace decorations in the overlaps. 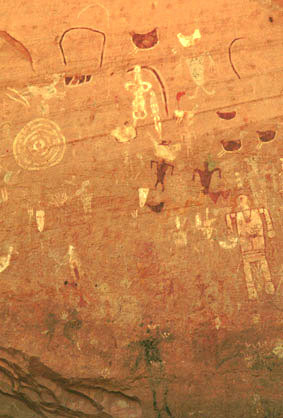 On the rightmost edge of the Puebloan pictography several Navajo pictograph were added (the fourth image). The site also has other Navajo pictographs. 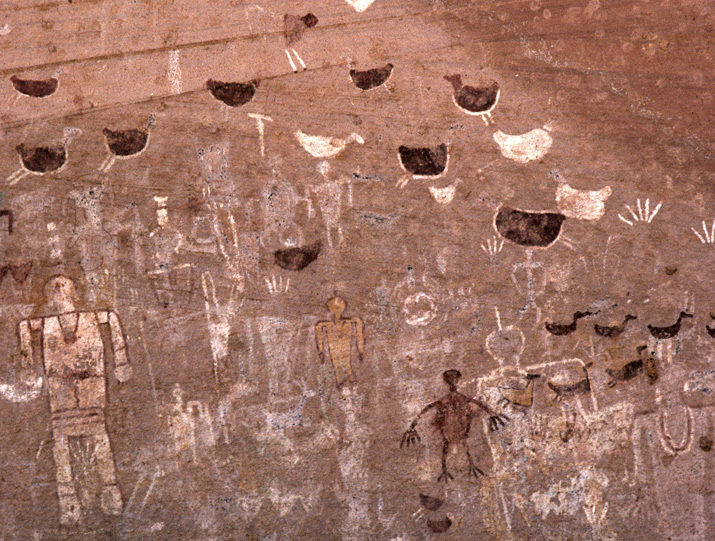 The following view features three pictographs on the cliff at White House Ruin. Where the cliff looks like a fish an "eye" was added! This is an excellent example or rock incorporation. 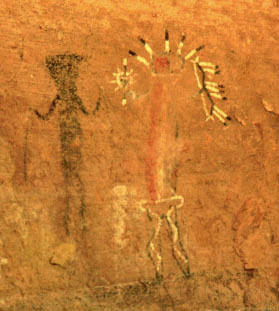 Navajo pictographs of the Narbona expedition.